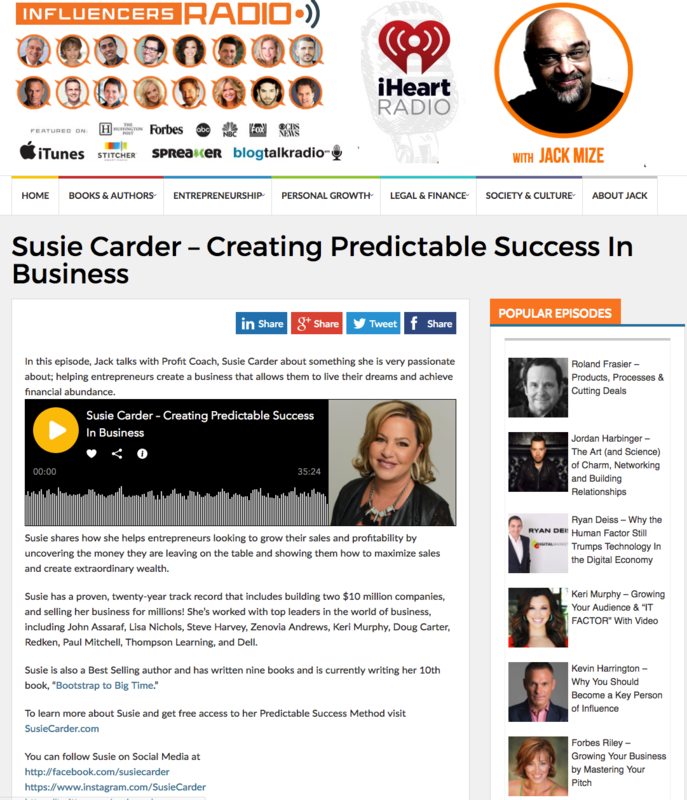 Susie Carder is a business coach and BELIEVE BUSINESS SHOULD BE FUN, NOT PAINFUL! She is passionate about business owners living a life that is fulfilled! Achieving holistic success is a priority for her and her clients. Susie’s commitment is that all of business owners are paid the value they bring to their business and are the first to be paid not the last. She BELIEVES IN MAKING A DIFFERENCE IN THE WORLD! You are a gift from God and what you do is your gift back to your community which makes a difference in the world! PROFIT is an essential part of success and it should be planned for. It is imperative for long-term sustainability. PLANNING and STRATEGY brings peace of mind, it allows business owners to spend more time with family, friends and in activities that they love outside of work. Building Your Own Financial Freedom! Uncover the secrets of building Wealth and Wisdom, learn to leverage your most value asset, YOU! Identify what is holding you back from your financial greatness. Create the money system and the financial strategy to live your dreams! Have you heard of people who have “blown up” financially? Have you noticed how some people have a lot of money and then lose it, or have excellent opportunities start well but then go sour on them? The vast majority of people simply do not have the internal capacity to create and hold on to large amounts of money and the increased challenges that go with more money and success. That, my friends, is the primary reason they don’t have much money. On the other hand, the opposite occurs for self-made millionaires. Notice that when self-made millionaires lose their money, they usually have it back within a relatively short time. Create your own money plan! Every entrepreneurs dream is to build a 7- figure business but only 1% of entrepreneurs achieve that dream. Learn the predictably system to support you in creating hyper growth. Leaders Make Great Teams, Teams Produce Results. Leaders must be able to see their people as “whole people” – body, heart, mind, and spirit – and manage and lead accordingly. As a result, leaders spend their efforts creating a place where people want to stay and in which they are enabled to offer their best, time and time again. Every successful business starts with a vision and a plan. 80% of small businesses fail in the first 5 years of business. Be the top of the industry by following the Predictable Success Method. ou’ve bootstrapped, drained your savings, leveraged all your credit cards, now what? This training is designed to look at how to raise money to take your business to the next level. Money is everywhere you must learn the language to attract investors and key strategic partners. What’s the best strategy for MY business? Understanding the full scope of what it takes to start and run a small business is overwhelming. This training is designed specifically to help you develop a solid plan and learn what it takes to build a thriving business.